HIAWASSEE, Ga. – Hiawassee Police Chief Paul Smith presented the department’s 2018 activity statistics during the first city council meeting of the new year, Jan. 28. In 2018, 1,142 traffic stops were conducted by Hiawassee Police Department, with the most activity occurring in July. Smith relayed that the summer spike was due to the Hands-Free Georgia Act. As a result of the traffic stops, 681 tickets were issued, 362 written warnings were given, and hundreds of verbal warnings were extended. 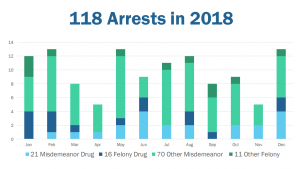 Last year, the city police department made 118 arrests, 21 of which were misdemeanor drug violations, and 16 were cited as felony drug offenses. The remainder of the arrests amounted to 11 felonies and 70 misdemeanors. According to data, there were 98 fewer arrests made in 2018 than in 2017. Likewise, fewer drug arrests occurred in 2018 than the prior year. Of the 118 arrests, Smith informed that 80 of the arrests were the result of traffic stops, accounting for half of felony arrests. A total of 335 reports were filed in 2018, consisting of 205 incident reports, 87 accident reports, 32 miscellaneous reports, five domestic violence cases, and two juvenile reports. 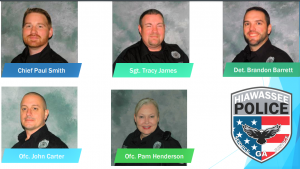 While the statistics show that criminal activity has decreased, Hiawassee Police Department remains vigilant in their duties, a reasonable explaination as to why there has been a reduction in arrests. “It’s good to see numbers drop in law enforcement,” Chief Smith said.